Krosstech’s Linen Trolley is designed with the end user in mind which makes it the perfect equipment for transporting linen. It’s an easy-to-use, no-fuss product that you should invest in. It is built with a low profile to make sure that vision is not obstructed. It also has document holders for easy organisation of files. 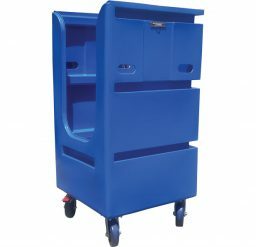 Each linen trolley has the capacity to carry 650 LTS of items which means it can keep up with heavy duty work. It comes installed with durable 150mm castor wheels for safe and reliable manoeuvring. It is fitted with 3mm galvanised plate which makes it resistant to rust. And did we tell you that it is easy to clean too? Krosstech’s Linen Trolley is available in a various colour options so you can easily identify the trolley’s assigned purpose. The linen trolley is available in the following colours: yellow, red, magenta, purple, dark blue, light green and black.